Some that come to mind: horse to car, index card to online search, PC to mobile, web to app, portal to messaging, Newton to Einstein, oil to electric, rock to rap, Aquinas to Bacon, buying to renting, files to streaming, network TV to cordkilling, broadcast to social, programming CPUs to programming biology, server to cloud, vm to container, wired to wireless, long read to TLDR, privacy to public to ephemeral, paper based news aggregation to digital aggregation, checks to online banking, gold to fiat to bitcoin, linear to exponential growth, large to small teams, to a world that ignores you to a world the responds to you, nation states to who knows what, a military of people to a Military of Things, and weekly versus binge watching. Any others? 1.) steroids to gene doping to ??? 3.) drug smuggling via mules to drug smuggling via unmanned submarines to ??? 4.) ethernet to wifi to LTE to pCell/5G??? "Anything invented after you’re thirty-five is against the natural order of things"
I tend to agree with ajax, if (and only if) that is the understanding of the reader. I think however that this meaning wasn't the intention of D.A. and he simply used exaggeration here to make a point. Just ask yourself, how many people in your business, and even more in your personal environment would fit into that picture? There are quite a lot. Where I absolutely agree is, to what extent one thinks of himself whether or not he/she keeps up with technology is nothing more than a mental question. I too believe, and I know people who would been considered retired by conservative standards yerars ago, yet they are vital, sometimes more active than the youngsters (when was the last week you worked from 4 am to midnight?) and still doing projects and deals big time. They simply refuse to stop themselves for such nonsense arguments like "being too old". Unfortunately, 95% of all people do exactly that. 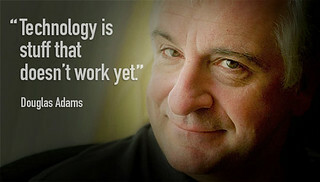 Douglas Adams was a great writer and loved technology and gadgets.